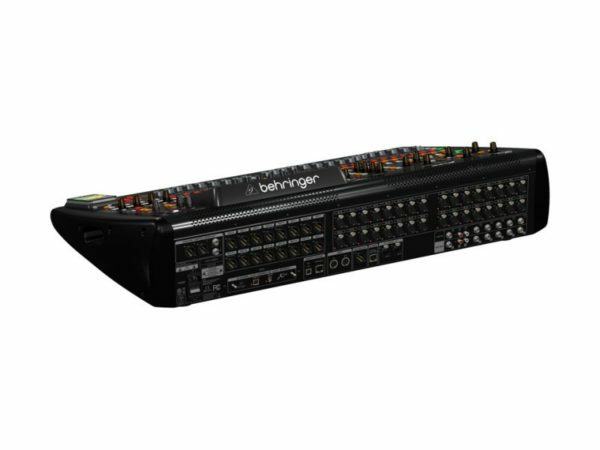 The Behringer X32 digital mixing console is an easy transition for engineers that are accustomed to mixing with analog boards. 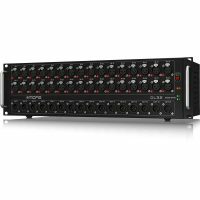 The 32-channel X32 incorporates 8 additional AUX inputs that add up to a total of 40 processing channels and 25 mix buses. All of which can all be controlled by a user-friendly signal processing section that provides instinctive, hands-on control of dynamics, EQ, and inserts. Ready for your input Use any combination of the local 32 console mic inputs or the networked digital snake inputs on stage. The dedicated channel strip section puts 17 backlit buttons and 13 rotary controls with LED-collars right at your fingertips for quick, analog-style adjustment of each channel’s compressor, 4-band parametric EQ and much more. 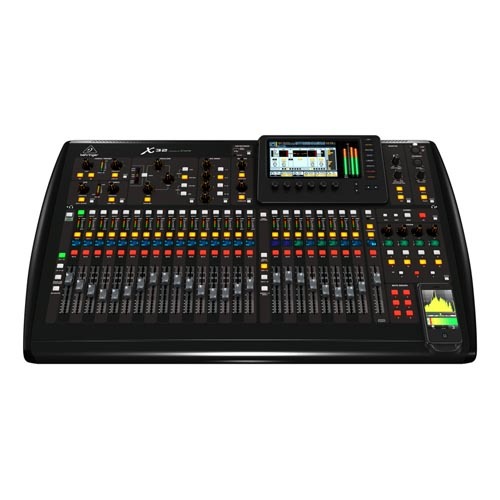 Each input and output channel strip features its own color backlit 128×64 graphic LCD, which provides vital channel information at-a-glance, such as input source names and icons, to quickly identify instrumentation in the mix. Each LCD’s information can be updated either by using the onboard display or an attached computer. Virtual FX Rack The onboard virtual FX Rack provides access to eight true-stereo, multi-effects processors (16 mono) including delay, chorus, dynamics—and it can run 4 production quality true-stereo reverbs concurrently with 8 channels of 31-band graphic equalization, all without the need for expensive, space-consuming external hardware. 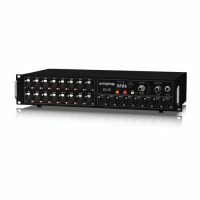 High-count I/O options I/O abounds with 32 high-end programmable mic preamps; 6 Aux Inputs on 1/4″ TRS; 16 balanced XLR Outs, plus balanced Control Room outputs on both XLR and 1/4″ TRS connectors. 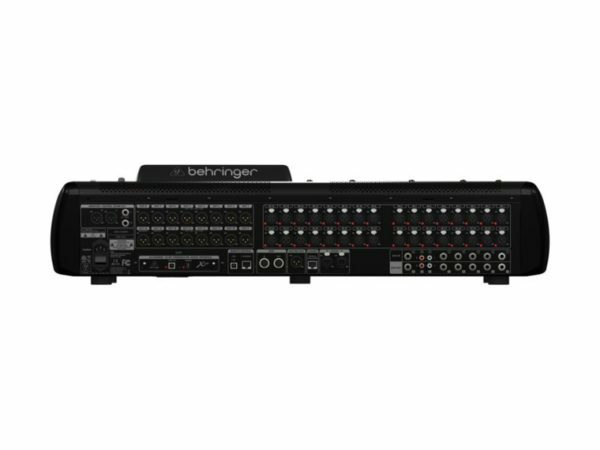 A single CAT5 cable from FOH to the stage can receive up to 48 channels of audio input—and deliver all bus outputs, along with 16 individual monitor feeds for BEHRINGER’s brand new P16 personal monitoring system. Vital information is just a click away Thanks to the netbook-resolution, 800×480 high-contrast color TFT display, you are never more than one or two button presses away from any of X32’s eight highly intuitive control screens. Once you select the desired function, dedicated rotary/push encoders allow you to set parameters and source I/O assignment, without the need to “drill down” through multiple layers of menus or page through a complex owner’s manual. Powered by MIDAS & KLARK TEKNIK Behringer teamed up with its sister companies, MIDAS and KLARK TEKNIK, recognized the world over for their digital consoles and EQ/FX processing, for implementation support. The programmable, high-grade mic preamps found in the X32 are based on a genuine MIDAS design, all the way down to their A/D converters. The resulting design ensures superior common mode rejection (CMRR) and extremely low harmonic distortion (THD). MIDAS and KLARK TEKNIK helped in designing the X32’s GUI (graphical user interface), a major advancement in digital mixing made easy, productive, and fun. They also drew on their extensive experience in FPGA (Field Programmable Gate Array) coding for rock-solid, ultra-low latency digital channel patching—giving the X32 the capacity to handle up to 168 sources on 168 destinations, including the two AES50 ports. Bus and rear panel flexibility X32 provides extensive output connectivity including 16 balanced XLR outputs, six balanced Line I/O on 1/4″ TRS connectors; dual Phones outputs; Main LCR (Left, Center, Right) buses; 16 mix buses (also configurable as subgroups) with Inserts, 6-band parametric EQ and dynamics processing; plus six independent Matrix Mixes with Inserts, also with 6-band parametric EQ and dynamics processing. 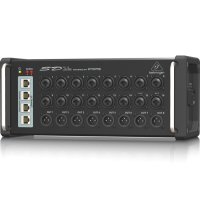 The rear panel also sports two AES50 ports, each with KLARK TEKNIK’s rock-solid SuperMAC 48-channel I/O networking capability (for addressing a total of 96 inputs and outputs). Stereo digital output and MIDI are also supported, as well as ultra-low jitter, ultra-low latency communication between the X32 and digital snakes, remote stage boxes and outboard recording devices. 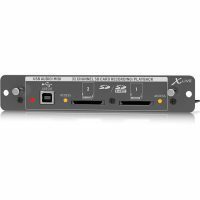 A convenient top panel USB port is available for recording an uncompressed two-channel “board mix” straight to any standard USB thumb drive or for playing background music.